Notice the long, aligned torso and coordinated bending in the ankles, knees, and hips. 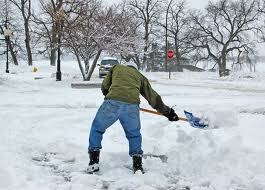 See what results you get when you allow yourself this balanced way of moving when you shovel. At the very least, avoid the compressed, hunched way of shoveling in the first photo, and see how much less fatigued and achy you are when you’re through. Of course, we all work our muscles in a special way when we do manual labor like shoveling. A great way to reward yourself for your hard work is to lie in Constructive Rest for a few minutes when you’re through. Here’s some guidance for your “lie-down,” as the Brits call it. Now have some hot cocoa and a cookie! Whatever you find yourself doing in this hectic winter season, remember to slow down, tune into yourself, and breathe!